Original RPPC photo of a trooper of I Troop, 4th Cavalry holding two cats at Schofield Barracks, Hawaii, circa 1913-1915. Photo from Corporal Edward W. Lewis, S/N 731612. Lewis was born in 1888 in Johnstown, Pennsylvania and worked as a miner there before WWI. From 1913-1915 he was in I Troop, 4th Cavalry in Hawaii. Later he was in the 6th Infantry Regiment, 5th Infantry Division in France from 1918-1919. After WWI he settled in Massillon, Ohio. From the archives of the World War History & Art Museum (WWHAM) in Alliance, Ohio. WWHAM designs and delivers WWI and WWII exhibits to other rmuseums. Our traveling exhibits include Brushes With War, a world class collection of 325 original paintings and drawings by soldiers of WWI, and Iron Fist, an HO scale model of the German 2nd Panzer Division in 1944 with 4,000 vehicles and 15,000 men. Somehow one doesn’t really think about Hawaii in WWI (as opposed to the big role it got in WWII), but of course the war was there too. I wonder what this long-ago Pennsylvania boy thought of Hawaii? Surely the army in Hawaii must have offered some advantages over the mines of Pennsylvania, although home is home and he was very far away. France followed Hawaii for him. I am glad we know he made it through and settled in Ohio – maybe keeping cats there and thinking of his army kits. These are two great scrappy kitties, barely out of kittenhood, but ready to take on the world. A striper and a tuxedo – tops in my book! Give them the enemy, Germans or mice, and let them at ’em! Pam’s Pictorama Photo Post: Our friends over at Google translate this as Lucky Airplane and certainly they are taking no chances! Bedecked with every lucky symbol, as well as a few I didn’t know, such as the ladybug (I know it is bad luck to kill them) this is a plane promises quite a ride. I admit I’m not sure what the thing that looks like a beehive or the pansy-thing are – I’m open to suggestions – and everything is tied with a bow which is a nice touch. The black cat is obviously lucky (see our recent post Lucky Black Cat if you have any questions), although the fact that he’s peddling this plane into flying seems a tad ambitious and he does appear to be concentrating. I had to cast around a bit on the subject of those industrious looking white rats as lucky. Logically though, rats are seen to have a sixth sense about danger and death, so I guess if the rats are satisfied all is good and these are all but dancing on the wings. 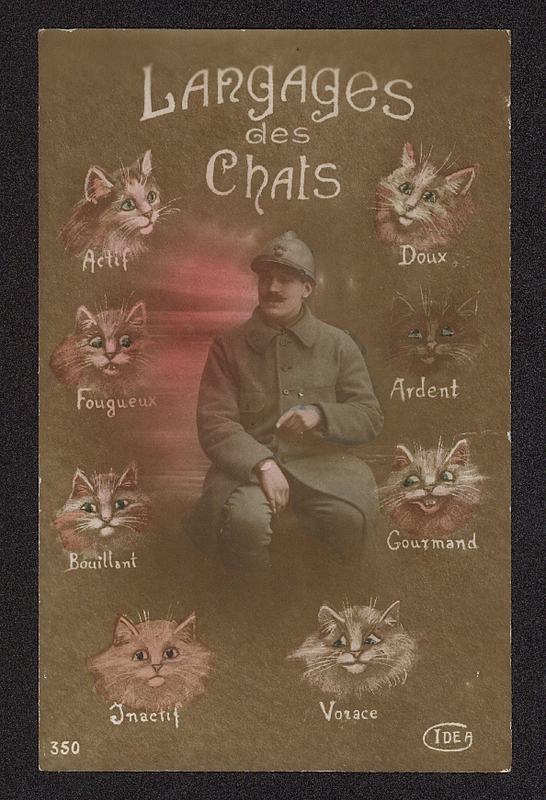 This card belongs to the same family as the one featured in Speaking of Cats which I show here below. These seem to be WWI genre cards – different companies, Rex 696 and the one below by Idea. 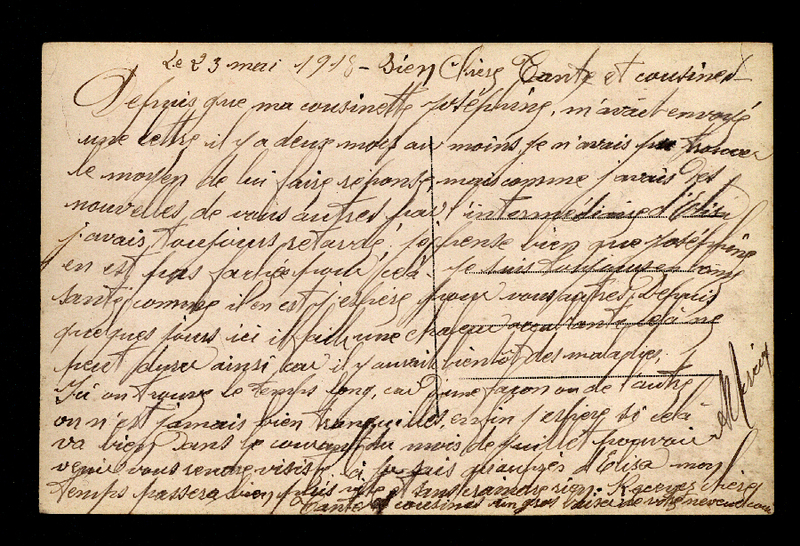 I have included the back of the card, and perhaps a French reader will be kind enough to send us the gist of it, as it is too densely written for me to begin to translate. Despite the writing, it does not appear to be postally used or properly addressed which also does confuse me. However, for now I just say, Up, up and away!